Through the years, others joined my mental chart of measures. Start frying spring rolls when a dry chopstick, lowered into the oil, sends up a rush of bubbles. Don’t eat at a restaurant with the word “authentic” translated into English. A thin girl eats one bowl of rice, a polite girl two bowls. The brownies are ready when only a few crumbs stick to the toothpick. Cooking school and restaurant work lengthened the list of informal guidelines. Cook a fish ten minutes for every inch of thickness. A properly butchered beef carcass will produce 1/4 steaks, 1/4 ground beef and stew meat, 1/4 roasts, and 1/4 waste. A classic mire poix is 2 parts onion, 1 part carrot, 1 part celery. Roux is equal parts flour and butter by weight. A cake is done when it springs back from a loving tap. Professional caterers employ some of the most specific calculations for feeding people that are, in their way, merely interconnected rules of thumb. Are the guests standing or sitting? Sipping lemonade or knocking back cocktails? Celebrating a friend’s birthday or waiting around to sign big, fat donation checks? Are the plates 5″ or 7″ wide? Are there mostly women or men? Is it a cold morning or a hot night? Each factor changes what kind and — more importantly, how much — food appears on the tables. 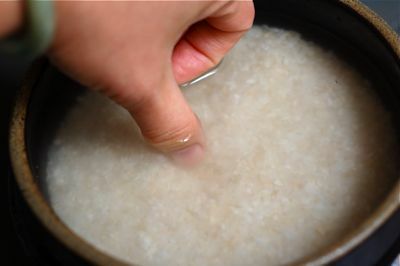 In the end, it’s as much a guesstimate as that thumb in the rice: based on experience, fluid, and as exactly right as it needs to be. At his ambitious and thoroughly enjoyable website, RulesofThumb.org, Tom Parker has collected thousands of informal guidelines from around the world. The simple rules were originally sent to him on postcards in the 80s, when he started the project, but he’s since gathered them onto a site where readers can search by keywords, contribute their own R.O.T., and rate those submitted by others. One elephant provides the same amount of meat as one hundred antelopes. For long trips, plan on at least two pounds of food per person per day. The quality of food at a restaurant is inversely proportional to the size of the restaurant’s freezer. If at their first daily feeding, catfish rapidly swim to the surface, stick their heads out of the water, and gulp for food, everything is O.K. If they are sluggish or don’t come to the surface, promptly change the water. One pound of clay thrown with reasonable competence on a potter’s wheel will make a vessel large enough to hold one average serving of most kinds of food. When you order Chinese food, order one entree less than the number of people in the group to avoid unwanted leftovers. To dissolve, without cooking, 17 pounds of sugar requires 1 gallon of hot water. This makes two and a quarter gallons of liquid sugar. If cows remain lying in a group on a rainy day, then fish will not bite. Don’t drink water downstream from the herd. The hymn “Onward, Christian Soldiers” sung in a not-too-brisk tempo makes a good egg-timer. If you put the egg into boiling water and sing all five verses, with the chorus, the egg will be just right when you come to Amen. If a choking person can verbally request the Heimlich maneuver, he or she doesn’t need it. You can live three seconds without blood, three minutes without air, three days without water, and three weeks without food. Each of these reminds me how much more interesting human-based measures can be. Forget the conversion charts and fear-inducing recipes that crackle with numbers. What we need are more colorful stories embedded in plain advice. What’s your favorite rule of thumb in the kitchen? And where did you first learn it? Spaghetti is done when it sticks to the ceiling. I learned it at college, in a large group house, a rental. The quality of food at any given Mexican restaurant is inversely proportional to the tastiness of its margaritas.